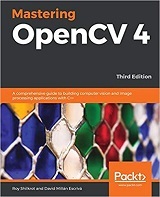 Unleash the real power of OpenCV and Python with this free book! Featuring over everything from the very basics to advanced concepts as you discover computer vision algorithms, models, and OpenCV's API to enable the development of all sorts of real-world applications right now. Intended for novices to the world of OpenCV and computer vision, as well as OpenCV veterans that want to learn about what's new in OpenCV 3, this book is useful as a reference for experts and a training manual for beginners, or for anybody who wants to familiarize themselves with the concepts of object classification and detection in simple and understandable terms. Basic knowledge about Python and programming concepts is required, although the book has an easy learning curve both from a theoretical and coding point of view. Joe Minichino is a computer vision engineer for Hoolux Medical by day and a developer of the NoSQL database LokiJS by night. On weekends, he is a heavy metal singer/songwriter. He is a passionate programmer who is immensely curious about programming languages and technologies and constantly experiments with them.